New World Notes: WHO'S AFRAID OF THE COPYBOT? WHO'S AFRAID OF THE COPYBOT? Last week it seemed as if it might savage the world, but less than seven days later, it's truly difficult to even find the damage, let alone assess it. As I write this sentence, at about 4:30pm SLT, nearly 15,000 Residents are currently in-world, while over the last 24 hours, the L$ equivalent of over $600,000 has traded hands. All signs of a thriving economy and a bustling society, not one teetering on the brink of disaster. 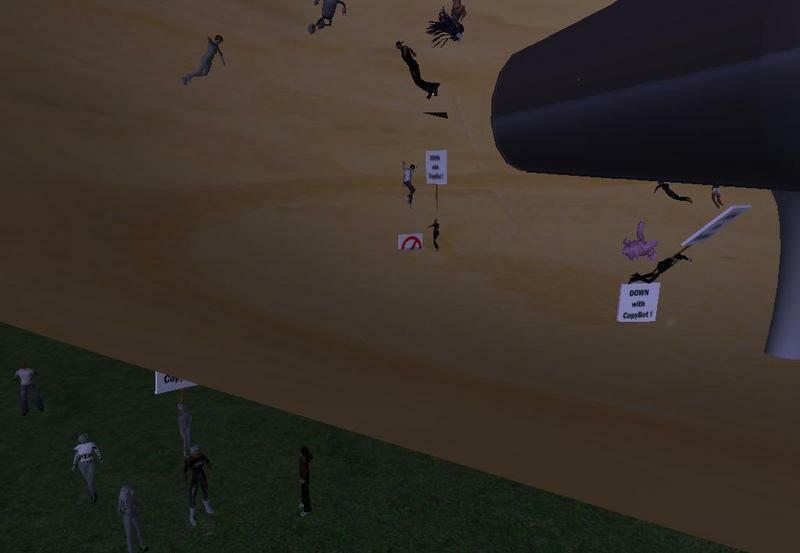 In retrospect, it seems that the Second Life community experienced an information cascade, a collapsing domino reaction based on incomplete knowledge and the behavior of influential individuals, leading to a rush of boycotts, protests, and giant boulders. Among those influencers was TOmmy Fairplay, owner of the DragonFly club and shopping emporium, the most popular location to join the boycott. "One by one the creators were closing shops," he recalls now. "I was one of the first to close both of my sims down... I think it wasn't one person but a big group of creators that did. It wasn't spoken, 'Hey, let's all close it.' Was like, for example, I stood up and said, 'I'm closing.' Then the next person did the same, and so on and so on. Everyone was in a panic and Linden Lab was doing nothing, so we took the control into our own hands by closing down our sims, lands, etc." While he still stands by the boycott, he goes on, "I think a lot way overreacted... people on the Forums, people in the groups, were just going off on things when they had no idea really what the program could or could not do. They-- and I'm not speaking for all, but some-- didn't take the time to do the research before just saying, 'Ohh no, Black Friday.'" Now that he knows more about the hack's limitations*, he's less worried. In a supreme irony, someone associated with content vendors like him installed and ran CopyBot, to figure out how to reverse engineer protections against it. "I simply do the basics," he says. "The CopyBot from what I've gathered from people who have tested it can NOT read foreign letters, so I put these letters in my group titles." Fairplay cites some other protections, which you are also likely to see (along with large anti-CopyBot warning signs) at many popular locales. The only obvious evidence of CopyBot's harm, in other words, are the defenses created against it. "All this," I muse, "to prevent a program that far as I can tell, has never actually stolen content from anyone." "[K]nowing what I know now, compared to last week in those first hours, I'm not worried about the CopyBot harming my content or business in any way," TOmmy Fairplay acknowledges. "But I'm not sayin' it shouldn't be banned, because I do. It has caused much havoc in SL, and needs to be gone for peace of mind." And while many other content creators and vendors are concerned, most of those I spoke with in recent days offered a reaction that was measured, and decidedly wait-and-see. Some of their thoughts after the break. I think its creation and release to the general public was one of the most socially irresponsible things I've ever seen anyone do in Second Life, and that it happened through a group where Lindens were actively participating is shameful. The analogy I've been using in the Forums is that we all know the windows in our cars can be broken. We don't need someone to come along to smash them and steal our stereos as some kind of public service demonstration of the lack of security in our vehicles. The "If we didn't do it someone else would" defense isn't something I'd accept from children, let alone adults. Having said that, prim-based content creators are now in the same boat that texture artists have been in ever since Open GL texture rippers arrived on the scene. The only thing content creators can do about it is to try to provide good services that offer benefits to honest customers that thieves aren't able to get, like add-ons, updates, and the like. We also need to keep hounding Linden Lab to develop features that make it easier for people to move to a service rather than single sale model (like extra texture layers for avatars) and make it easier for us to police our content. (Metadata for proving first use and the ability to see what people are wearing and where they acquired it will be a good start.) Most importantly, content creators need to keep in mind that despite how easy it is to feel cynical and under siege, the vast majority of people are honest. Chip Midnight makes some of his real life living creating and selling custom avatar skins. [I] do not think that it poses a direct threat to anyone. The number of people who even know about it is fairly small as far as SL numbers go, and from what I've heard, it's difficult to figure out as well. The idea of a Better Business Bureau [in SL] has been bouncing around for ages, but that would take a lot of organization that content creators-- by nature, solitary designers who are used to working by themselves-- just don't have. Fashion and skin creator Lo Jacobs makes some of her real life income from her Second Life content, and is aiming to make it a full-time career. When I first heard about [it], like so many [I] kinda thought, there goes the neighborhood... My opinion quickly changed when Linden Lab announced people using it would be in violation of TOS. That made me feel a lot more relaxed about the situation, that it wasnt just going to be "Hey, file a DMCA, thats all we can do." Having it be against the TOS, meaning we can abuse report people using it, made it feel a lot more safe. [T]o move on, to still keep an eye out for one another but really, to go on and not dwell on it. The more attention it gets, the more curiousity it causes to people who would have never even thought about using it. So yeah, basically I think the content creating community should remain vigiliant in filing abuse reports, but essentially, move on and carry on as usual. 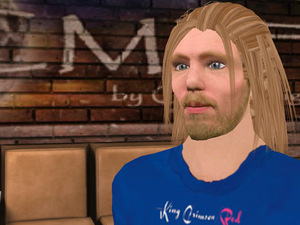 Hair designer Six Kennedy makes some of her real life income from her Second Life content. It's not great to see how easily my creations can be copied now, but I know my businesses can continue to thrive. We've already seen top skin and hair makers' work stolen, yet they're still top creators. It's a risk of doing business and you can't let it demoralize you. And honestly, that risk even with CopyBot around isn't as great as a lot of people hyped it up to be. I think the content creating community (or really, its subcommunities, since SL is so big now) has been good at supporting each other, getting the word out when a theft happens. That support and the support of our honest and appreciative customers goes a long way. And I'm hoping whatever Linden Lab is working on to make it easier to establish first creation will help with that and with pursuing DMCA where necessary. Fallingwater Cellardoor makes much of her real life income from the creation of virtual fashion, flowers, and other accessories. I think people should make sure they have all the facts before we all fly into a blind panic, myself included. I think the future holds something that will be able to do what CopyBot was originally purported to do, and we all really WILL be in that kind of trouble if we're not given the proper tools to deal with it ourselves. They should make sure they know what it's capable of before they start a mass panic. It's really no worse than GL Intercept which hasn't destroyed my business yet either. 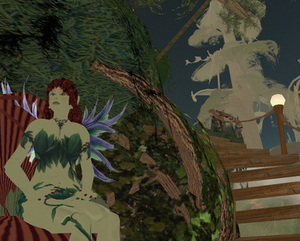 Second Life changes so rapidly these days I can't keep track of what's affecting my business. Could be lag, could be gray goo, could be CopyBot, could be one hundred things. Anonymous is a top content creator in Second Life. "This is my income. This is my entire job. It supports my family. [So] I don't take things like CopyBot lightly." *Update, 8:32pm SLT: According to CopyBot's creators, the hack could not copy contents of objects, or scripts within an object. In other words, any copy was merely surface level. I said as much in a blog post last week. It was scary to see how quickly the mob mentality took hold of the community, leading to many over-panicked reactions. From what I've seen, Copybot Defender has done more harm than Copybot. It's a device that works by spamming the shut-down code for Copybot. If you read my earlier comments on the Listen script lag of Bling jewelery, you'll see that every spamming copybot defender linearally increases the lag caused by sloppy listen scripts. Worse yet, while it technically DOES work to shut down the Copybot program, Copybot can't actually copy items that are inside vendors, so putting it in your store does little if any good. People can still copy your items if they own a copy or see someone wearing it. Yes, mob mentality and a complete disregard of the facts. Indeed, a week later the mainstream media is still echoing the distorted issues related to it. There were some who gained from this hype. I noted on my weblog that my stats were up everytime I posted a technorati tag for copybot. I wrote about the truth of the capabilities of Copybot, about true copyright issues and methods to handle them, and put all of that out in the public - as did a few others - but that didn't echo. In fact, this is the first post that I've seen like those posts in about a week which wasn't within the VoRT (Voices of Reason Team, a fictitious name for the group of bloggers who didn't flip into mob mode). But, you see, mob mode gets you more hits on website advertising. My position on this is that Copybot demonstrated how poor the media in general reported things - and I am not picking on anyone. Rather, I am pointing to the echoes of copybot that are still going on. Right now the echoes are mainly about the 'worm that made rings' for about an hour on Sunday. Makes the whole thing sound horrid. The mainstream media has no excuse. Blogs are allowed and encouraged to post opinions, though we would hope that they would be good ones. Yet mainstream media has been avoiding the facts at all costs it seems. Chip Midnight said: "Metadata for proving first use and the ability to see what people are wearing and where they acquired it will be a good start [towards making it possible for vendors to police their content]." 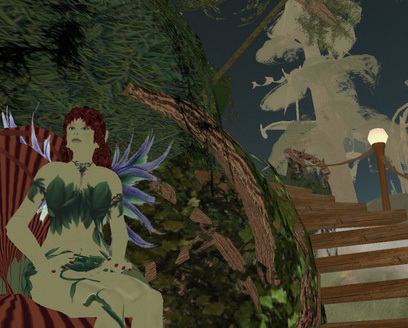 Ironically, once that metadata is present and visible, libsecondlife's work should make it possible to write a "Robocop" sort of agent that checks whether avatars walking past legitimately own what they have on--an external conscience reminiscent of Delaney and Stiegler's _Valentina: Soul in Sapphire_. What good is it to own stolen goods if you can't wear them because you never be sure you aren't being checked out? @ Melissa - When libsl does something like what you suggested that's helpful rather than harmful I'll be the first to applaud them for it. We'll have to wait and see how useful the metadata turns out to be. @Chip - Libsl already did a great, helpful work by reporting bugs and security issues to Linden Labs, letting them fix the app before someone could exploit them. FYI, Lindens explained this more than once in their official blog and other public places. And the really hilarious thing is, the copied object doesn't even stay around. Once the copy-from object is purged from the simulator's local cache, the copy-to object no longer has the assets to exist and is automatically cleaned up.